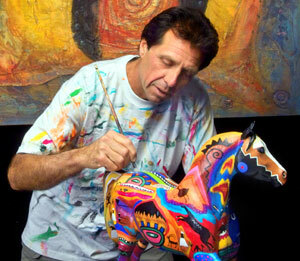 Mitch E. Robles is highly regarded for his unique blend of abstract expressionism and contemporary Native American Design. His powerfully primitive and boldly colorful images are both a revelation and a celebration of his Cumash Indian ancestory. "My paintings are my personal quest for my cultutal and spiritual identity," says this 11th generation native of Santa Barbara, California. Since early childhood, his love of history and the outdoors led him to continually investigate and photograph indigenous ruins and sacred sites in California and throughout the Western United States. It was through these explorations thta he developed a deep sense of connection to his own ancient lineage which is now reflected in his art. Robles, a nationally recognized and accomplished artist, has exhibited in galleries throughout California, as well as galleries in Scottsdale, Santa Fe, and Jackson Hole. In addition, his art has been featured in Southwest Art Magazine, the Ritz-Carlton Magazine and textbook publicatins throughout the United States. Robles' art has also appeared in several Sundance Film Festival documentaries and in 1997 was featured artist for the American Library's annual celebrity READ poster, A Global Newspaper Rock. His ceremonial War Shirt series is inspired by the traditional ceremonial was shirts of the Lakota and other Plains tribes. 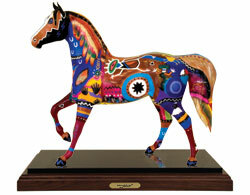 He has created these three-dimensional images as symbols of tribla honor and power. Robles uses the rich textures of layered canvas and heacy impasto to evoke the feeling of buckskin, and decorates his shirts with the authentic ornaments that were sewn onto original war shirts: porcupine quills, horsehair, beading and feathers. Pictographs and petroglyphs from many Native American sites througout the southwestern United States are also embedded in the paintings as a statement of the artist's wish for unity and connectedness among all tribes. His contemporary expressionist Longhorn Series features Southwestern-style Texas longhorn cattle that confront the viewer with a profoundly masculine soulfulness. THe wide range of symbols and imagery in his Rock Art Series dance with a vitality and mysticism tht entice the viewer into a magical spiritual journey.